Choosing a dog should never be taken lightly. Never buy a dog on impulse! And always consider adopting one of the many great shelter dogs. The first question you should ask yourself when considering becoming a dog owner is not “What kind of dog should I get?” but “Am I truly ready to bring a dog into my home and family?” Dog ownership can be a rewarding and wonderful experience, or it can be miserable for everyone involved. It is crucial to be absolutely certain that you are prepared to change your lifestyle to accommodate the needs of a dog BEFORE you get your heart set on any particular dog. Are you ready to get up earlier every morning for the rest of your animal’s life so that you can take him for a walk before work? If you live alone and work long or unpredictable hours, who will make sure your dog gets fed, walked and taken out to the bathroom? Bringing a canine companion in your life will mean sacrificing some of the spontaneity you may now enjoy. And don’t forget – dogs live from ten to fifteen years or even longer. Dog ownership is a long-term commitment! The most common reason for animal abandonment from even the most well intended owners is “I have to move.” This is of course exacerbated in BC by lack of legislated access for pets, including dogs. Are you in a stable living situation? If you did have to move, are you willing to make a commitment to ensure that the dog will move with you? All dogs need training and it’s important to recognize that in the first year or so of their lives, you will need to make a commitment to train and your dog to be comfortable around other people and dogs and to know how to behave in public. Are you willing to put in the time and effort to socialize your dog and give it basic obedience training? The most important investment of time you can make for your dog should be made before you’ve even met the dog! You need to seriously consider what kind of dog you, your home and your lifestyle are suited for. Too often, people fall in love with a puppy or feel desperate to help a dog they’ve seen at a shelter – only to bring home a dog that’s totally unsuitable for them. This can be devastating to everyone involved, including the dog! Having clear parameters in mind about such things as age, expected size, coat type, activity requirements, temperament, and potential or known health or training problems will help you make a good decision about the dog that’s right for you. Puppies should be at least eight weeks old before leaving their mother. At five or six weeks old, puppies are barely weaned! They should also have had at least one set of vaccinations before you bring them to their new home. Getting a dog doesn’t always mean getting a puppy. While there are benefits to being the first owner of a dog – there are many benefits to adopting a dog that’s not a puppy. Not everyone has time to raise a puppy; an adult dog may be the solution. Older dogs need new homes for many different reasons, most of which probably have nothing to do with the dog itself. It is not uncommon for even expensive, purebred dogs to be surrendered to shelters when their owners move or are no longer able or willing to take care of them. Older dogs have known personality traits that make them an excellent choice for households with small children. They may have already reached their maximum size, will likely be house and possibly, obedience trained, have probably graduated beyond the chewing-everything-left-in-reach stage and may already have been spayed or neutered. The energy level of the adult dog is also likely to be more compatible with a household where everyone is in school or at work during the day. By adopting an older dog, you will not only save a dog from being euthanised but will also make a statement about compassion and the value of all life at all ages, at the same time as bringing a wonderful addition into your family – a win-win situation for everyone! If you think you might be interested in adopting an older dog, get in touch with the vets, groomers, boarding kennels and training centers in your area. Contact rescue organizations, visit animal shelters, and look in the newspaper. You may be able to negotiate a “trial period”, particularly if the dog comes from a rescue organization to insure everyone is happy and getting along before a firm commitment is made. If you do have your heart set on getting a puppy, here are a few tips on how to pick one from a litter. Try and call the puppy to you by kneeling down, clapping gently and calling to him.A confident puppy will come readily, tail up and attempt to play with your hands. Stand up and walk away from the pup in a normal manner. Make sure the pup sees you walk away.Not following indicates independence, which may make training difficult later on. Crouch down and gently roll the pup on his back and hold it with one hand for a full 30 seconds. Fierce resistance, such as flailing and crying out indicates difficulty with submission Let pup stand up and gently stroke him from the head to back while you crouch beside him. Continue stroking until a recognizable behavior is established.The pup may try to dominate by jumping, nipping or growling, or may accept your dominance by cuddling up and trying to lick you. Bend over and cradle the pup under its belly, fingers interlaced, palms up and elevate just off the ground. Hold it there for 30 seconds.Again, fierce struggling and growling are indications that the dog has a tendency to be dominant, and little or no struggle indicates submission. Dominant dogs may have aggressive tendencies, both with people and other dogs. They do not make good pets for children or the elderly. There could be difficulties teaching the dog “its place” in the social order of your household. These dogs should only be considered by someone who has experience with dominant dogs. Pups that submit readily and avoid eye contact may be overly submissive and aren’t a good choice for a first-time dog owner. They will need special handling to build confidence and bring them out of their shells. These pups do not adapt well to change. They do best in very structured environment. They are usually safe around children but may bite if severely stressed. Ideally, pups should struggle a bit, and then settle with some eye contact. Crouch beside pup and attract its attention with crumpled up paper ball. When the pup shows interest and is watching, toss the object 1 to 2 meters in front of pup.There is a high correlation between ability to retrieve and willingness to work with a human. 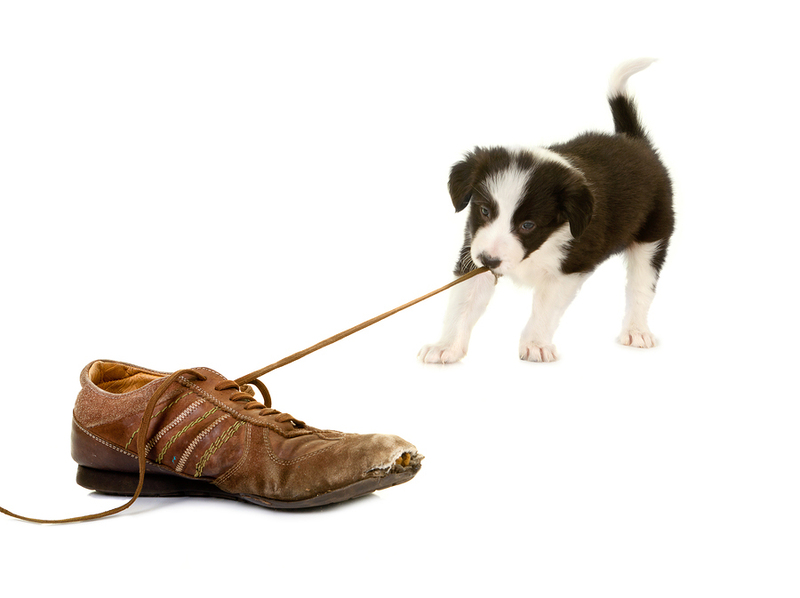 Take puppy’s webbing of one front foot and press between finger and thumb lightly, then more firmly till you get a response, while you count slowly to 10. Stop as soon as puppy pulls away or shows discomfort.If the puppy starts squirming in less than a 3-4 seconds, it is very sensitive to touch. If you’re looking for a “snuggle-bunny”, this may not be the right dog for you. Make a sharp noise a few feet from the puppy.Cringing and/or attempting to hide may indicate the puppy is shy. If the puppy ignores the sound, he may have a hearing problem. Ideally, the pup will try and locate the sound and show some curiosity about it. Place pup in centre of room. Tie a string around a large towel and jerk it across the floor a few feet away from the puppy.Running away and hiding is not a good sign! It requires a great deal of extra work to help a “spooky” dog adapt to new situations or sudden changes. Some dogs can become very aggressive if they are frightened, so delicate handling will be required to prevent this from happening. 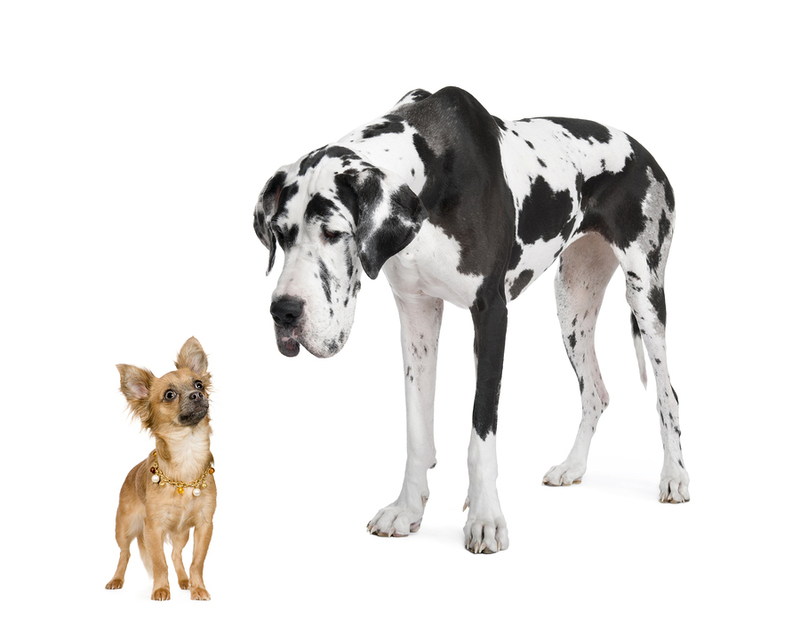 Dogs range in size from the tiny Toy Poodle to the very large Great Dane – and everything in between. Consider the size of your home, your yard, and your vehicle. But, don’t be fooled into thinking any small dog will be content in a small living space. Some small dogs, Jack Russell Terriers for instance, require a LOT of exercise. Conversely, some very large breed dogs, like Mastiffs, are content to flop on the floor and do nothing all day. Are you interested in a “lap dog” or a dog big enough to protect you or your home? What about your ability to handle the dog, on leash or off? There is generally a standard range of sizes for any given breed of purebred dog. It can be a little harder to predict the size that a mixed breed dog will reach. If the dog you are considering is a puppy – it may help to view the dog’s parents, if you can. If not, you may want to ask a veterinarian to give you an estimate. If you are adopting a dog from a shelter, generally they will attempt to identify which breeds a dog may be and estimate a size for you. Almost all dogs have coats that shed to one degree or another. How do you feel about dog hair and dust bunnies? Does anyone in your home have allergies to dog hair or dog dander? Many breeds of dog require regular coat care and grooming. This could mean investing in a dog brush, and spending time using it or it may mean taking the dog to a professional groomer. This can add up to quite an expense over the lifetime of a dog. Dogs with oily outer coats can develop an unpleasant “doggy odor”. Dogs with short hair may not be suited to cooler, northern climates – particularly if they will be expected to spend a great deal of time outdoors. There is a huge variation between breeds and individual dogs as to how much activity they require. Some are very energetic and need almost constant physical activity and mental stimulation. Others are content to be companion animals and need very little exercise to stay healthy. Are you looking for a dog to take running and hiking, or a couch potato to keep you company? Typically Basset Hounds, Dachshunds, and Bernese Mountain Dogs don’t make great jogging companions. Similarly, Border Collies, Australian Shepherds and Jack Russell Terriers are not ideal for being left alone for long periods of time. How much and what types of exercise could you provide for your dog? If your time is limited, you should look for smaller or less active dogs that can obtain enough exercise in your home or from short walks. Ask yourself if you are willing to make a commitment to the level of activity and attention that this dog will require. Under and/or over- exercising your dog can have serious consequences on their health, happiness and your relationship with them. While most dogs tend to “slow down” as they mature, it may be several years before this happens! There are pros and cons to either gender– all of which are generalities and may or may not apply to a specific dog. By all means, if you have a preference, get the gender you want. If you are not sure, it really doesn’t matter — look for the dog you hit it off with. As with size, the general temperament of any particular breed of purebred dog is usually well known to breeders and veterinarians. Some terms used to describe dog temperaments include: aloof, loyal, dominant, aggressive, independent, gentle, intense. However, as with people, dogs can be quite individual! If you are interested in a purebred dog, you do some research on several different breeds before making up your mind about any one in particular. Most libraries will have a good selection of books on this topic, as does the Internet. You should also consider attending a dog show where you can see adult specimens of the breeds you are interested in. Make sure you buy your dog from a reputable breeder and ask to see the parents as well. A reputable breeder will try to match the puppy’s temperament to your family situation. 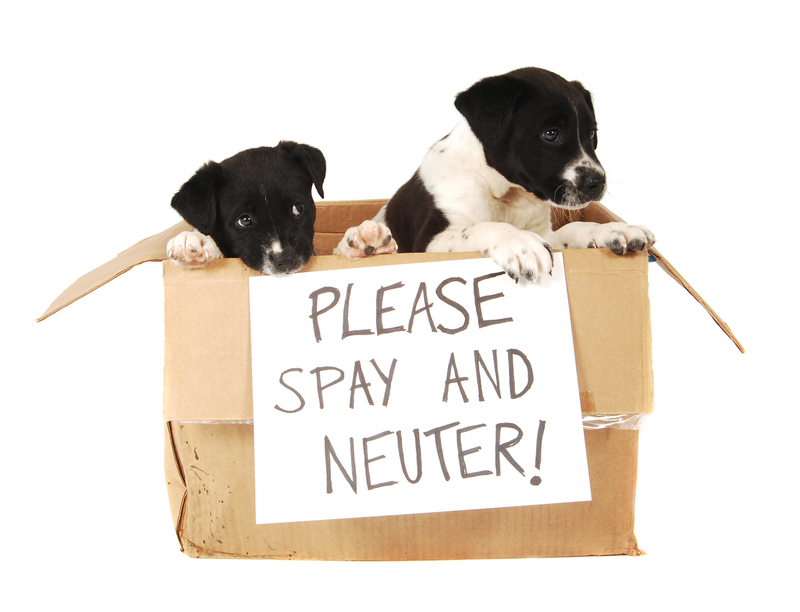 DO NOT buy a dog or puppy from a pet store … responsible breeders never sell their puppies through a pet store. Even if the store tells you otherwise, it is likely that the puppies are from puppy mills. For a fantastic resource on the topic please see No Puppy Mills Canada and Shut Down Puppy Mills. You won’t be sorry you made a little extra effort to make an informed choice, and you’ll have a compatible, happy companion for years to come!